Travelling days normally consist of the stressful reorganization of the backpack, followed by grumbles of why things aren't fitting in as before, a tense waiting period where you wonder if your booked transport will arrive and finally a hot, sweaty, slightly confusing journey where you really don't know what's going on but hope you get to your next hotel. 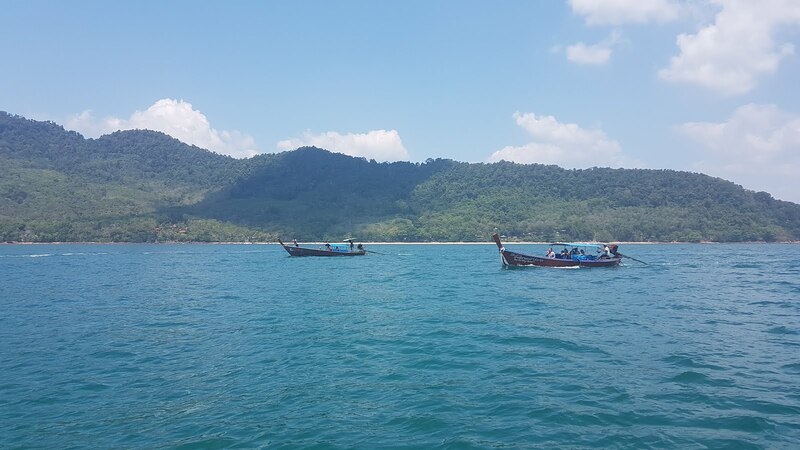 It was much the same on this day as we left Krabi town for Ko Jum - a peaceful island an hour boat journey away. Mild panic set in as the mini-van was over 30mins late to collect us from the hotel, turns out we didn’t really need this bit as the jetty was only 5mins walk away but we didn’t know that as all internet resources had told us it was miles away. Having arrived at the crowded dock you are given stickers denoting where you are traveling to and then you wait huddled in the pockets of shade with about 50 other people. 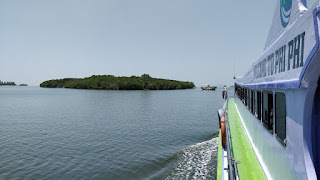 The boat arrived and all luggage was shifted aboard, they tried to keep it in two separate piles as the boat does about 3 drop offs along the islands, and then after a bit of a wait for some latecomers we headed out to sea. Ko Jum Island actually goes by 2 names as neither end of the island can agree on what its name is, so the north call it Ko Pu and the south call it Ko Jum. As our hostel was on the Ko Jum half we were the second drop off, which meant we got to watch the chaos of the first one as preparation for ours. As you near the drop off point the larger resorts send out local long boats that tether alongside and then you climb from the ferry into the correct boat, which can mean climbing over 2 other boats in the process and don’t forget to keep an eye on your luggage and ensure it gets into the correct boat with you. 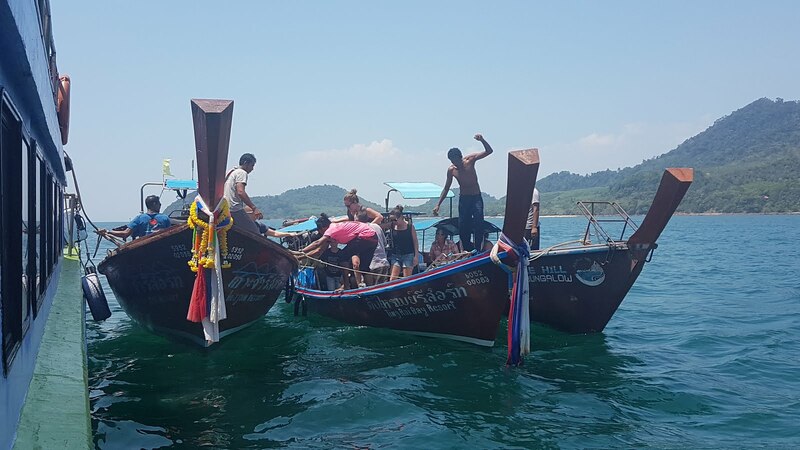 The long boat then sets off at a quick pace, showering belongings and people in the front with a never ending salty spray. 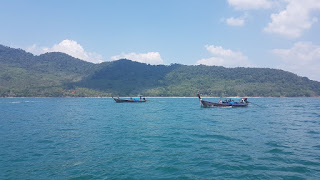 How wet you get leaving the boat will depend on whether it’s high or low tide as the boat can only pull up the beach so far, so there is always a bit of water to wade through but as I had sat at the front of the boat so was already soaked it didn’t really matter. Our hostel was called Ko Jum Hostel and was set about 2 km from the beach area, so they rang for someone to come and grab us in a motorbike with side car – giving us a quick 10 min to have a beer. It wasn’t until later that we realised they hadn’t charged us for the boat taxi in – but the island is quite laid back so no-one really worries about this sort of thing. The Hostel is in the middle of the main road that connects the two nicest beaches (or the only two we bothered to visit) and is basic but clean. We’d booked a double room with aircon but actually got a huge apartment sized, annex type place, with a front door into a large empty room, then a separate aircon bedroom with no windows and round the corridor was a small shower room with toilet, sink and shower. The only issue was the toilet paper dispenser was attached to the wall in the corridor. Very strange but seeing as in Asia they don’t use toilet roll maybe this was a deliberate tactic. We were staying here 5 nights so a full unpack happened and then we left to check out the lie of the land. 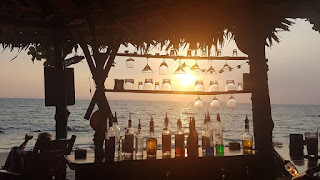 We walked about 10mins down the deserted road passing 1 bar, 1 restaurant, a launderette (3 washing machines by the side of the road), and a hospital that looked closed before deciding to have a drink at the Fu Bar connected to the Golden Pearl resort. 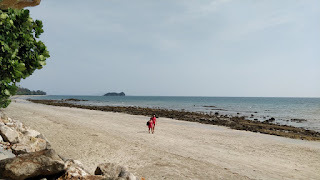 The beaches on Ko Jum (and all of Thailand’s islands it would appear) are tidal and you can only swim at high tide, the sea will then cover the rocks and makes for the white sandy beaches you see in all the pictures. As it was low tide by the time we’d got down there and the fist tidal beach we’d experienced, I will admit to being a bit disappointing to look out on black craggy rocks that displayed no hope of paddles or swimming. 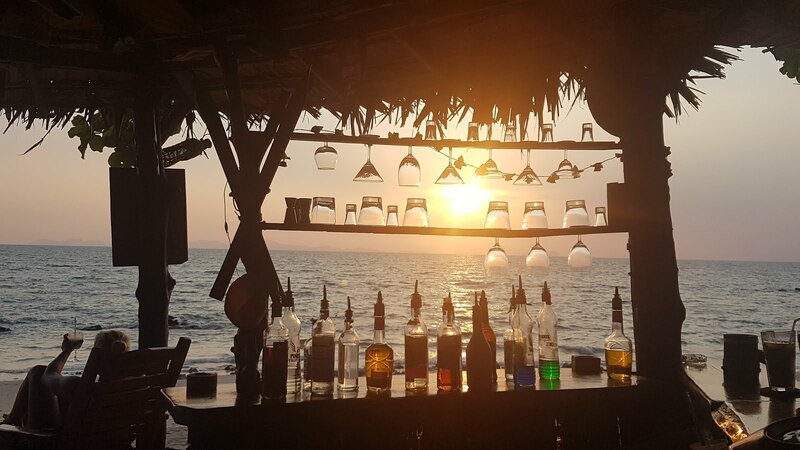 The bartender at the Fu bar (called ‘O’), was a very laid-back guy that smoked his home roll ups in-between making cocktails and chatting to us about island life. He told me to come back to the beach tomorrow morning between 8-11 to see what high tide looks like, as it’s very different. For dinner we decided to walk the other way from the hostel to a place we’d passed earlier called Friendly Restaurant. It was very busy and the food was amazing but it was a reminder that in Thailand medium spicy is a bit too hot for my tastes. I still scoffed the lot but my mouth was on fire for a long time after. Paul who had opted for a mixed grill (which was amazing) just laughed at me. When sleeping in a room with no windows we discovered that you needed to set alarms if you want to wake up before the morning was over! It was a delicious lie in though so I wasn’t that upset. As we had to walk past Friendly restaurant again on the way to the beach, we decided to stop for a quick breakfast. It was a tasty but simple serving of scrambled eggs on toast with fruit juice but I suspect this breakfast was the cause of some upset later. By the time we got to the beach the tide was past it’s best for swimming with the rocks just beginning to break the surface, so we settled down to read and watch the very few tourists go by. By the time evening came Paul was beginning to feel a bit queasy but we walked half hour or so to a restaurant up the road and had a couple of nice Chinese dishes and then asked if they could get us a taxi to save us the walk home. She said no problem, goes off and grabs her teenage boy and his motorbike sidecar taxi thing and tells him to take us back to the hostel. When we get back I ask how much but he just mumbles that’s it’s no problem and wouldn’t give me a price. I stuffed a 100b note at him and thanked him very much, once again gobsmacked at how laid-back things are on this island. Sadly, poor Paul was still feeling ill the next day, and although I’d had a touch of it as well Paul was worse than me and wasn’t feeling up to go out. 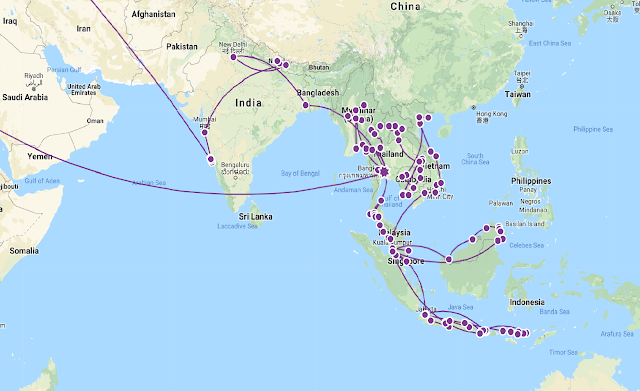 We stayed in our nice cool cave and planned more of Thailand and started looking at Malaysia and used the time deciding what to do in the coming months. With me back at full fitness and itching to swim I woke early the next day and left Paul snoozing. A quick walk back to the beach and I discovered a totally different scene - The tide was completely in. 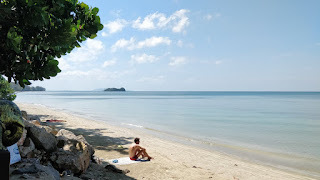 This was the picture postcard beach I’d seen and I swam, read and swam some more before heading back to the hostel. This was generally how our time on Ko Jum lasted with me going off each morning for a swim at one of the two near beaches, lazy afternoons hiding from the sun then early evenings watching the sunset with a beer or cocktail in our hands. We had a brief but hilarious brush with 3 cockroaches that decided one night around 12am that our bedroom was the only place to be, which led to us leaping out of bed armed with books and begin trapping them under upturned bins, or scooping them into bin bags to be taken outside. I hope there weren’t any hidden cameras in that annex! 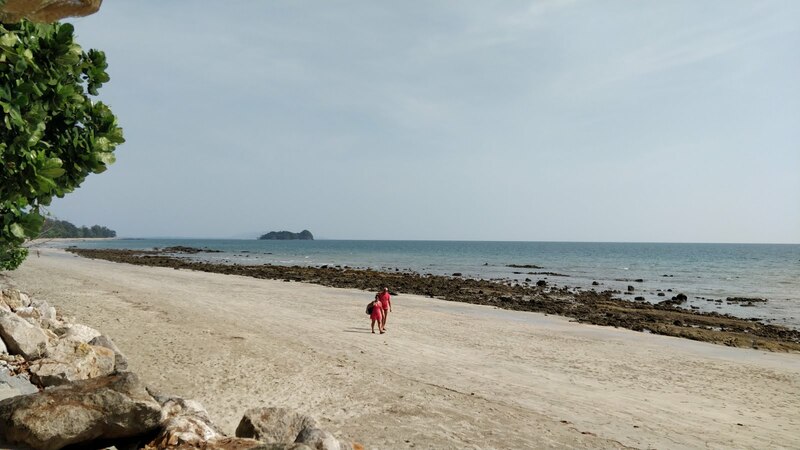 After 5 days of remote island life it was time to move to on, I’d really started to enjoy my Ko Jum routine but I think Paul was eager to get somewhere with a little bit more going on and the next place we were heading to, Ko Lanta promised just that.